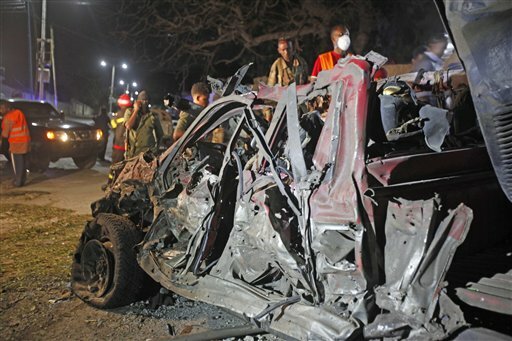 N’DJAMENA, Chad (AP) — At least five suicide bombers on Saturday targeted a village in Chad that is home to thousands of Nigerians who have fled Islamic extremist violence, killing at least 36 people and wounding about 50 others in what appeared to be coordinated attacks, officials said. Authorities blamed the extremist Boko Haram group from neighboring Nigeria for staging the attacks in the western village of Baga Sola, according to a communique from government spokesman Hassan Sylla Bakari. It said 41 people had died, including the five suicide bombers who were identified as two women, two children and a man. Female suicide bombers hit the market in Baga Sola when it was at its busiest Saturday, killing at least 16 people, said the director general of Chad’s gendarmerie, Gen. Banyaman Cossingar. A second group of suicide bombers killed at least 22 people at a nearby refugee camp, he said. Cossingar gave a preliminary toll before the government released an official count. Cossingar’s figures apparently included two of the suicide bombers. There were conflicting reports on the number of wounded. The government’s official count was 48, while UNICEF said at least 53 people were wounded, including 14 children. Police spokesman Paul Manka said the attackers staged five bombings, adding that two were near the refugee camp but not in it. “There were three explosions at the Baga Sola market and two explosions near the Dar-es-Salam refugee camp. From our information, the explosion was not in the refugee camp, but in a part of the village nearby,” Manka said. It was not immediately possible to independently verify the differing claims due to the extremely remote location of the attacks. For months, Baga Sola has been home to thousands of people who already had fled deadly Boko Haram attacks in Nigeria. The U.N. says the Dar-es-Salam camp now has just over 3,000 refugees, and can house up to 15,000. The village is in the Lake Chad region near the border with Nigeria, where Boko Haram first launched its insurgency six years ago. Amnesty International says the uprising has killed 20,000 people. While Boko Haram has attacked Chad’s capital before, the bombings on Saturday appear to be the largest and most elaborate staged yet in the country’s lake region. Chad has become a major military ally of Nigeria in the fight against Boko Haram, which earlier this year threatened to retaliate. In June and July, Chad’s capital, N’Djamena, was rocked by a series of suicide attacks that killed dozens of people — the first such attacks since Boko Haram threatened Chad. Boko Haram, which has pledged its allegiance to the Islamic State group, has also stepped up attacks in Nigeria and neighboring countries since Nigerian President Muhammadu Buhari took office in May pledging to halt the uprising. Boko Haram has used dozens of girls and women in recent suicide bombings in Nigeria, Chad, Cameroon and Niger, raising fears it is using kidnap victims to target countries involved in setting up a regional force to combat the extremists. Ahmed reported from Dakar, Senegal. Tags: Chad, extremist Boko Haram, government, N'DJAMENA, Suicide Bombers. Bookmark the permalink.